On their adventure, they meet the sole woman living in a row of abandoned mining houses and paste her face to the front of her home. She’s so overwhelmed she bursts into tears. They also take photos of the wives of dock workers and paste them, side by side, on a massive stack of shipping crates, then ask the wives to sit inside the hearts of their blown-up images, flapping their wings like birds. There’s also a curious incident where they try to visit the home of Varda’s old friend Jean-Luc Godard and are rebuffed by a note written in black marker on a pane of glass. More on that later. The film won the top documentary prize at the Cannes Film Festival, plus the People’s Choice Award for a documentary at the Toronto Film Festival. This year, Varda will receive an honorary Academy Award (or as she’s called it, “a consolation,” “the side Oscar,” and “the Oscar of the poor”), and it’s likely she may even get an Oscar nomination for this film. At a time when it feels like you can’t turn on your phone without seeing news of sexual harassment or an impending nuclear war, this movie is a welcome antidote, filled with love and the goodness of ordinary people. See it immediately, and then again and again. 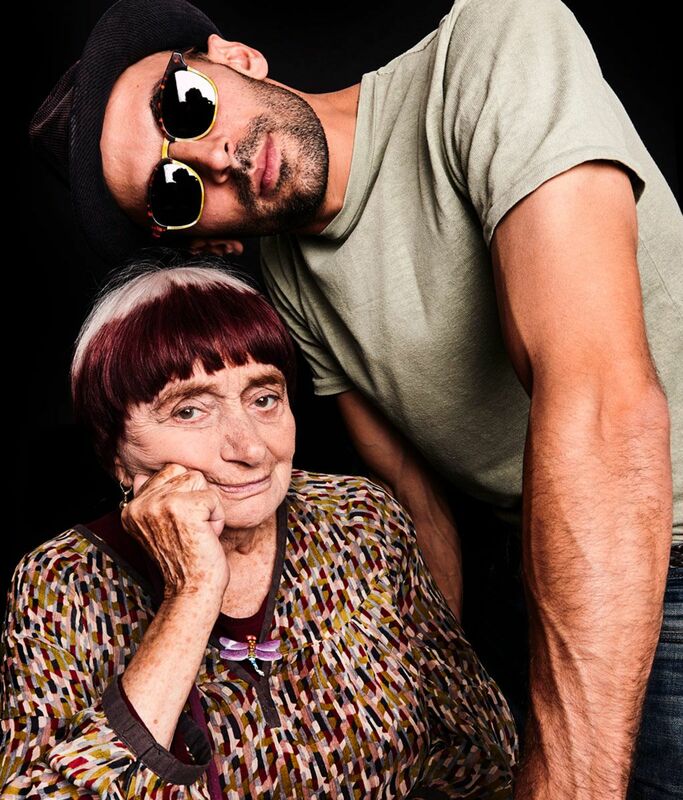 Vulture spoke with Varda and JR about their trip, what happened with Godard, and how aging can be like carrying around a backpack full of memories. Bonjour! I love the movie. 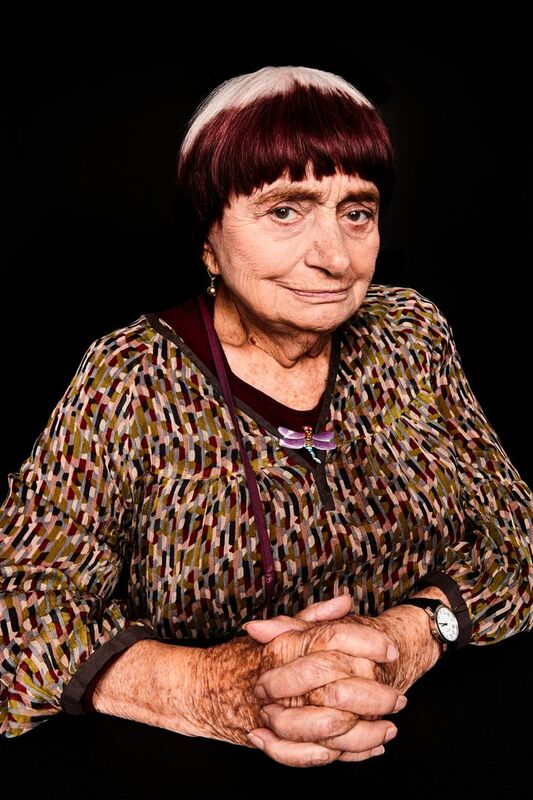 Agnès Varda: It’s a good start. AV: And what is your name? JR: [saying letters in French] J-a-d-a. AV: [spelling it out in the air with her finger; Varda has an eye disease that makes it difficult for her to see] It looks like a name in a film, you know? Jada. And you are from where? AV: No, your own person. Oh, my father is Chinese, if that was what you were wondering. AV: Ah! That’s the new world. People coming from everywhere making a new kind of people, which I love. My father was Greek, but he turned French during the war, and my mother was French. So I’m French, but I have Greek blood. I know other French-Greeks. It seems like a popular combination. [To JR] Ohm look! You have your sunglasses off! I thought you never took them off. Agnès is always teasing you about your “disguise” in the film. JR: Sometimes I do this for Agnès even if she can’t see. AV: You don’t have a camera. So then you are allowed to see his eyes. When JR and I met, we started to be friends — I would say at first sight. He could show his eyes to me. But he’s so conscious of if there is a camera. He never failed. I don’t know where the glasses are, but right away they’re on his eyes. Is this true, JR? You’re very self-conscious? JR: I’m careful because I’ve never appeared without, so of course I have to [wear sunglasses all the time]. AV: I think it’s a way of being nice, to show his eyes. JR: Sometimes she agree that I can be nice. Very rarely. So the movie starts off with you two imagining all the ways you didn’t meet: at a bus stop, in a nightclub. How did you actually meet and how did the friendship blossom? JR: Well, Rosalie, the daughter of Agnès [also the producer of Faces Places], invited me to take coffee with Agnès, because she realized we never met and we knew about each other’s work. So I went to her place and then I invite her to my studio the next day. It’s kind of crazy now when we think about it, but the next days we started working on something. Not on a film, but on a little video. We just wanted to do something together and that’s what drove the idea of making a film. AV: Because our aims, on his side and on my side, had some common points, really: to be interested in other people, unknown people, not being famous people. We decided on people who have no power. People that you can meet in villages. He was a city artist, really, and I say, “I change something in your life. I take you in the country.” That was the first time that he really worked outside of big cities that he had known, like Shanghai or Hong Kong. JR: She changed my life. It was interesting to just go on a road trip and go to little towns that I would normally not stop by in my own country, which I did in a lot of places, but not in France. People make a lot about the age difference between you two. What do you think is the commonality? Why does your friendship work? AV: What I noticed is he walks faster than me. He can climb on scaffold. He does physical things that I can no longer do. But why should age be important? It doesn’t disturb him. It didn’t disturb me and I have grandchildren of his age! JR: We didn’t even felt the age difference. AV: The difference is impressed a little because he is curious of the way I age. So I let him look at me, with my eyes when I get the shots [to treat her eye infection, which is shown in the movie]. Or when I have difficulties to read the letters. I just think it interests him. AV: Pour elle ou pour moi? AV: Oh, look at that! Cookies! I don’t want to look at them [nonetheless takes one]. JR: [sad face] She took my favorite, you see? 🙏🏻 Thank you Toronto for the People's choice documentary 🥇 award for FACES PLACES ! Toronto Film Festival @tiff_net @agnes.varda !!! You seem to get along so well. Was there ever a point on the road when you got annoyed with one another? JR: It’s interesting, in our case, we jumped on a collaboration without even knowing each other. AV: I fell in love with your truck. It’s incredible. With people coming in for the photos and the photos coming out of the side. I found it magical, really. AV: We’d just meet people in villages by chance and then decide that person will be the center point of that village. We were taking time to listen to them. To let them feel good. And asking them to be part of the game. We would say, “This is what we’re doing. Do you like the idea? Do you agree to be posted?” We wanted them to agree to our idea. Especially at the big harbor. The freight dock, or the “village of men” as you called it. You had the workers invite their wives over and you took their photographs and pasted them like five stories tall on a stack of shipping containers. AV: That was a really man place, you know? And I said, as a feminist, “Hey, I want to see your wives,” and it became something in which [the workers] got involved themselves to help us. To do big wife, big women as totem. JR knew these guys and he knew the way that they are very virile and very strong and very cooperative with his work. So then I approached in my own feminist way, if I do say so, and the wives became a subject. These women are beautiful, no? JR: For a long time we thought it would be a short trip. But then in total it was 18 months. JR: There was, but very little. JR: No. Ope! That’s the second one. AV: I should not, eh? You want half of it? JR: Yeah, exactly. I want it. Is this what it’s like when you guys go on the road together? JR: I control whatever she eats. AV: He said something because he knows I should not have sugar. That’s why he’s strict with me, because I agree because I should not. JR: And also her tea, you only drop [the bag] in it for a second and you take it off. She’s very precise. AV: Which means after months he knows two or three things about me. JR: I know four or five. It seems like there must have been a lot of downtime. For instance, on the dock, it seems like you spent a full day waiting for them to stack the shipping crates together. JR: We love taking naps. Both of us. AV: When they built the thing in the harbor it was like being a kid watching someone play with huge Legos. JR, you’ve said that Agnès will Facetime you in the middle of the night? AV: Well, sometimes I wake up and I think of the editing of the narration and I’m afraid to forget it. So I type it and sometimes even I send it to JR, and then he said I woke him up. He never sleep, so I don’t disturb him. He says you use video call. AV: Not too much. He does Facetime. JR: No! You Facetime a lot. I have photos of that. But I only see the top of your haircut. AV: I don’t know how to do the Facetime. JR: I know. That’s why! AV: You call. You call me Facetime. JR: No, you call me Facetime. A lot. JR: No. I’m serious. Because you re-press on the last call that was made, so it’s always Facetime. If I call her from a number, she will call back that same number forever. AV: He’s a man of web. I’m not. JR: But you’re good at it because you know how to Skype. AV: Ask if all your grandmother know how to handle. But I do. There’s a moment in the movie toward the end where you go to visit Jean-Luc Godard, and you ring his doorbell and instead of greeting you, he’s written a note for you on the window, essentially standing you up and not letting you in. You got very emotional reading the note. My understanding was that it was a reference to your husband Jacques Demy [the now-deceased director of Umbrellas of Cherbourg], who’d been a close friend of Godard’s, along with you. Can you tell me what’s happening there? AV: JR had told me one day, “I’d like to meet him. You are lucky to know him.” And you know when you have friends, you want to introduce your friends, so I thought it would be a nice surprise for JR if I bring him to Godard, who I had not seen recently. We meet every four or five years to talk. And through Rosalie [Varda’s daughter] and phone calls, he gave us an appointment. JR: He was at his house. AV: It was an appointment at 11:30. So we thought, we take the train, we go there. Then phone call came to Rosalie, “Jean-Luc prefer 9:30 a.m.” So we went the evening before, we took a hotel, and we were ready at 9:25 on the way to see him. Then something happened we didn’t expect. So it became a surprise and it became the film. My surprise was so big and I was touched to tears, so we kept that because we thought, it’s honest to see that everything was going so fine, so lovely and here we bump into a wall. So we kept the bumping [in the final cut]. That’s the closed door of the film, but it happens in every life one or twice, or maybe a lot. Did it happen to you once? No. Maybe not. AV: You are a happy fellow. JR: [Laughs] No, of course. It happens to everybody. But that day was one we didn’t expect. AV: Because the thing that hurt me, it was in relation with Jacques Demy that I really miss and I still love him. So because he made the connection with Jacques, it became very hard and very strongly hurting. And then we think, we have to calm down. We go to the lake and we calm down. And JR explained to me something that I believe. He was very smart to understand that, in a way, Godard wrote a piece of the screenplay. He added something to the film. Maybe better than a meeting. Have you spoken with Godard since? Has he seen the movie? AV: I sent him the DVD and no answer. But this a strange man. We were very friend when we were young. But, you know, we were 30. We were 40. Then he change. He start to do political film. Then we went to America. We lost, comment? We lost view. AV: We lost contact. But I will see him here and there. When he is showing a film in Paris I will meet him five minutes. I know that he liked The Gleaners and I [Varda’s 2000 film about scavengers who make art in the French countryside]. That day I didn’t expect that to happen, but it builds something in the film. Did you like the scene? What I thought was so moving was that you walked away and you were mad at him, but you were also like, “But I still like him.” You were very generous in that moment. AV: You know, when I love somebody I cannot drop it out of my life. Love is not something like you open and you close, you know? So, I remember loving him being friends with Jacques Demy. We had holidays together. We enjoyed life. I cannot erase that. And I admire his work. I think he’s an incredible inventor of cinema. He’s a searcher. He’s a philosophical filmmaker, and that’s so rare in the world. He’s unique. So I really admire his position. Does it mean that he’s nice? Has nothing to do, you know? As a filmmaker, I still give him my admiration. But as a man, as a friend, now? He’s sort of burnt. Did I read that Faces Places is going to be your last film? AV: It’s certainly my last film for movie theaters. The work I’ve done in last ten years — video installation, exhibition in museum, in art gallery — that’s more on my abilities now. When you do something for television, you advertise it ten minutes and then it goes on TV and gone. So the thing about a film for theaters is that, at least in France, there are 20 new films every Wednesday. We have to do so much promotion. It’s not boring. It’s just that takes half a year of our life. And it takes time away from making movies also. AV: It just takes our brain. We do it. I mean, we enjoy, because we’re able to enjoy ourselves all the time. At least, that’s a good thing. We never get bored from each other. So far, so good. What I’m saying is that the work of doing what is, in a way, necessary to get audiences, we do it. But again, it took us six month. And that I don’t want to do any longer. If I make a film, it will be experimental or show it on TV. I don’t want to reach the box office. The damn box office, because they can’t. When the film open in Paris Wednesday there is already one screening at ten in the morning in one of the theaters and everybody’s counting how many people came at ten a.m. Then how many people came the first day, and over the first weekend. Distributors. Everybody. They are with numbers. We don’t disagree. It’s okay. We did fine. My life cannot be directed by numbers. We want love from the audience. We don’t want the box office. Can I ask, is your hair a new color to match your outfit? It looks more burgundy than in the film. AV: In the plane somebody ask me, “When you change the color of dress, do you change your color of hair?” I say, “Yes, yes. When I do purple, my hair is purple.” He laughed. No. It’s just that I like that harmony of that dark red, vaguely red, purple. I like colors a lot. I’m very observant life. Observant colors. Observant gestures of people. That’s how you make documentaries, by observing, by being attentive. How did the whimsical moments happen? Like the part where JR re-created one of your eye exams by having people stand on steps and hold up giant letters for you? AV: I have to check my eyes very often and they always start with letters. JR: I wanted to understand what she sees. What is going through her mind. AV: But you made it big. It becomes a joke. Things which are boring because you have to check your eyes every two months. It became a game. “Oh, let’s enjoy huge letter.” When we say to the people, “Please move,” because I see letters out of focus and not very stable, I enjoy this very much. JR: And it was also lots of friends and people we know and love and people she know for years. So it was also sharing her vision and explaining it to everybody at the same time. AV: It allows me to treat illness with a side look, because we can always find some ideas and joy and humor about everything. Okay, I have problems with my eyes, but I love what we did. And when he wanted to bring a camera for the shot I have every two or three months, I say, “Why not? You can see it.” Then we thought of Buñuel’s film, An Andalusian Dog [and the scene where a razor slices through an eye]. And if Buñuel is such ugly thing, my little shot is nothing. It changes the point of view. AV: If everybody having sickness somehow could just change a point of view, they could enjoy what comes out of it, you know, enjoy your life or laugh or smile. In a way JR helped me to smile about these little things happening to me. Aging is interesting, you know? I really love it. Whatever you think, I love it. I don’t love it when it’s happening to me. AV: I think so many people are afraid of it. Afraid from five to fifty years old. Saying, “Ahhhh, this is the end.” I think, it’s so interesting to have lived all that I’ve lived, loved all that I’ve loved. It’s like a backpack, you know, full of memories and things and people I’ve met, and I forget some of them. It’s okay. They keep giving me signals to wrap up, so before I go, did anyone react negatively to having their picture up on a wall in their village? AV: No, she said that she accepted to be on the wall, but she did not understand that it would be that big and she feel shy. But then people give her compliment she say, “It’s okay. My children love it.” Have you heard of The Gleaners and I? AV: Somebody said about The Gleaners and I, “Since the subject was deep, because people eat what we throw away, your portraits were more related to difficulty of life.” And I say, “Well, the world is a mess. We have to always command the mess.” This time we command the simplicity of people. Not the mess. There was no drama in the film. But it’s difficult to work in a chemical factory. So we thought we were giving them friendship and making photo of hope. We’re saying that they are together, we are together with you. I think they felt good about that. I don’t know how much because doesn’t change their life. They still go to the factory every day. But maybe you gave them smiles. I see your next interview waiting in the wings. I must leave you. AV: I want to ask you, the first thing you said was that you loved the film. What did you love? It just … it filled my heart. I laughed, I cried. I felt so in touch with the beauty of humanity. In America we are having such a hard difference in points of view between the cities and the villages. AV: Do we always have to focus on our differences? Let’s be peaceful. This movie is about togetherness. I hope that people feel this, too. It is good to see a film that has no drama, no accident, no crime, no gun, no politics. We made our choice to make it this way. [Gestures for me to give her kisses] Have a nice end of the day.